Alastair Seeley celebrates his 22nd North West 200 victory. Alastair Seeley claimed his 22nd victory at the Vauxhall International North West 200 with a perfectly executed strategy in last Thursday's opening Supersport 600 race. It was Carrick man Seeley’s 11th triumph in the class at the event as he maintained his stunning record of winning at least one race at the North West ever since his maiden success in 2008. Carrick's Alastair Seeley celebrates with the EHA Racing team after his 11th Supersport win at the North West 200. Seeley put in a blistering sixth and final lap to break the tow of his challengers as he pulled away to win by 2.4 seconds from James Hillier on the JG Speedfit Kawasaki, with Fermanagh’s Lee Johnston claiming the final rostrum place on the Padgett’s Honda in third. Riding the EHA Yamaha, Seeley was involved in a thrilling five-rider battle, with Hillier, Johnston, Dean Harrison and Gary Johnson. The lead changed hand numerous times around the 8.9-mile course, with Seeley, Johnston and Harrison all having spells at the front as the 2018 meeting kicked off in spectacular fashion on a sun-kissed North Coast. However, Seeley utilised all of his experience as he made a break for it on the final lap, setting the fastest lap of the race at 117.671mph as he gained the upper hand when it mattered most. The 38-year-old eked out a small cushion to give himself some breathing room and Seeley, as he has done so many times before, brought it home along the Coast Road to add another win to his illustrious CV at the famous old road race. English rider Harrison could only finish fourth when a rostrum looked within his grasp, while the top six was completed by Lincolnshire’s Johnson on the Lee Hardy Triumph and Manx rider Conor Cummins (Padgett’s Honda). A delighted Seeley said: “I knew Dean and Lee were there because we were chopping and changing and I felt going into the last lap that we needed to push on to try and make that little break. “I was trying to get a gap to avoid being slipstreamed and the wee bike was faultless. It’s fast, which we need here, and the Yamaha R6 is working wonders in the British and World Supersport championships; I was excited to get onto it. 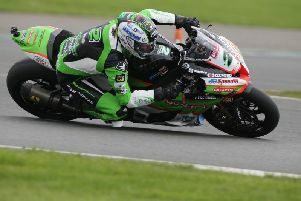 Runner-up Hillier said an earlier engine blow-up with his Kawasaki turned out to be a blessing in disguise as he claimed the runner-up spot. “It was a blessing that our engine went earlier because once we got going, it was a strong engine – maybe we should think about wrapping it in cotton wool for the island. Three-time winner Johnston finalised the podium on the Padgett’s Honda but the Fermanagh man was slightly disappointed after making a few errors on the last two laps. “I made a few little mistakes on the last laps and the Honda just lacks a bit out of the turns. When I get on the long straights it’s fast, but when there are two or three of them getting into your slipstream, it is no real benefit,” Johnston said. Ian Hutchinson was an excellent seventh on the Padgett’s Honda as he made his road racing comeback from injury. One of the pre-race favourites, Martin Jessopp, crashed out on the first lap at Mill Road roundabout, hampering a number of riders, including Michael Dunlop. The Ballymoney man eventually retired from the race. His brother, William, was also reported as a retirement at University on the Temple Golf Club Yamaha. Peter Hickman did not start the race after failing to register a qualifying lap on his Trooper Beer Triumph. Tobermore’s Adam McLean had been running in the leading group during the first half of the race but failed to finish on the McAdoo Kawasaki.